"We put it smack in the middle.....Vega"
That's from my favorite movie, Contact. The alien signal they get is from Vega in that film, so I immediately was drawn to the name. Vega is from the new spring PixieDusts Zoya released. I must say, I was willing to buy these individually and full price, but they ended up having an offer where if you bought a certain amount you'd get a mini set of this PixieDusts for free. I'm SO glad I did it this way for sure, because I hate this. 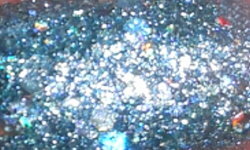 Vega is a light blue shimmer texture with holographic hexes. Color: The color is a nice metallic shimmering blue. I don't have a problem with the color here. Formula: This is chunky, dunky, oatmeal consistency mess. This is nothing like the previous Zoya PixieDusts,and I think the types of glitter they used in here ruined this entire thing. I don't find the finish on this to be at all pretty or appealing, it's a mess. Yuck. Price: This is $10 on the Zoya website. Overall: This is really disappointing. I think it's so disappointing because the previous Zoya PixieDusts have been so great. I'm not a huge texture fan, but I really loved the Zoya ones. This spring line is like taking 10 steps back. I really can't think of any redeeming qualities. Awful, I'm sorry. Love the color of it but bummer to hear the formula wasn't the same as their other Pixie Dusts. I don't like these either, never really liked textures other than the Pixie Dust kind with the sugary finish. The blue icy shade is really pretty though! Imperfectly Painted Turns 4 Giveaway!